Discrimination is a toxic instrument that unfortunately, rares its ugly head in so many forms. To those feeling discriminated against, there is that feeling of being unwanted, maybe because of our social economic backgrounds, race, gender, and sexual orientation. For one pup living in the high kill, Carson Animal Shelter in Gardena, California, he is facing the type of discrimination that often goes unaddressed at shelters across the country. 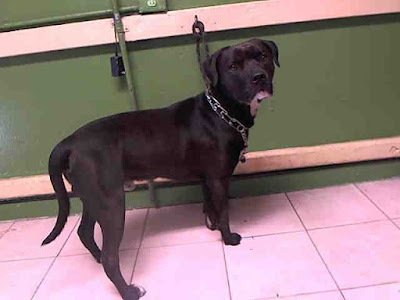 Kingston, a loving, charming, 2-year-old pit bull still languishes in a kennel, not because he isn’t the sweetest, most loving pup on the earth, but because he is the “wrong breed,” as my source at the Carson Shelter put it. In other words, Kingston is being judged by his breed, and not by the content of his character. According to some estimates, pit bulls are three times more likely to be euthanized in America, then any other animal. There is a terrible perception that dogs like Kingston are violent and harmful but that couldn’t be further from the truth. When visitors walk up to his kennel, Kingston is the first to greet them with a paw. He is a domesticated pup with proper manners, who staff says is calm, polite, and extremely friendly. In other words, Kingston is a lover, not a fighter. SpeakUp, a kill shelter is no place for a young pup with a promising future. Kingston needs a family, and if you or someone you know is interested in giving him a second chance, please contact the Los Angeles County Animal Control – Carson at (310) 523-9566 and reference the shelter ID #A5025782. Additionally, please share this story on Facebook or Twitter, so we are closer to finding Kingston a home. 0 Response to "Sadly, No One Wants To Adopt This Pup Living in A Kill Shelter Because He is The “Wrong Breed”"